Самолет спроектирован с использованием технологий малозаметности и оснащен самым современным БРЭО. 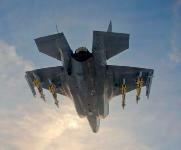 Компоновка самолета отдаленно напоминает компоновку Lockheed Martin F-22. 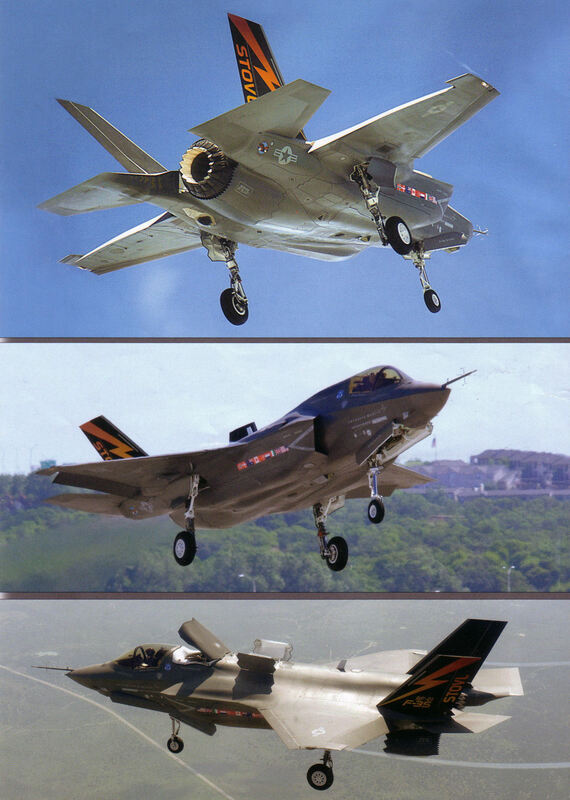 F-35 предназначен для ДальшеMore>>> замены самолетов F-16, F/A-18 Hornet, A-10 и Harrier II. 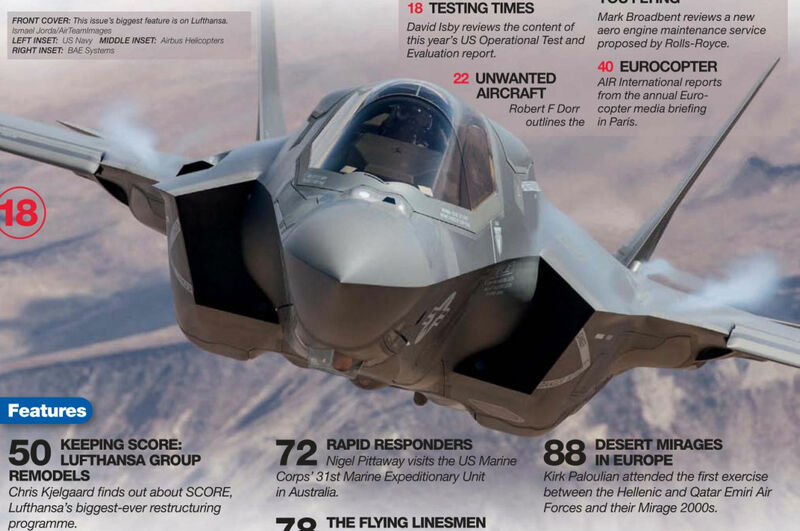 Основным назначением F-35 является поражение наземных и надводных целей, а ведение воздушных боев считается задачей второстепенной. 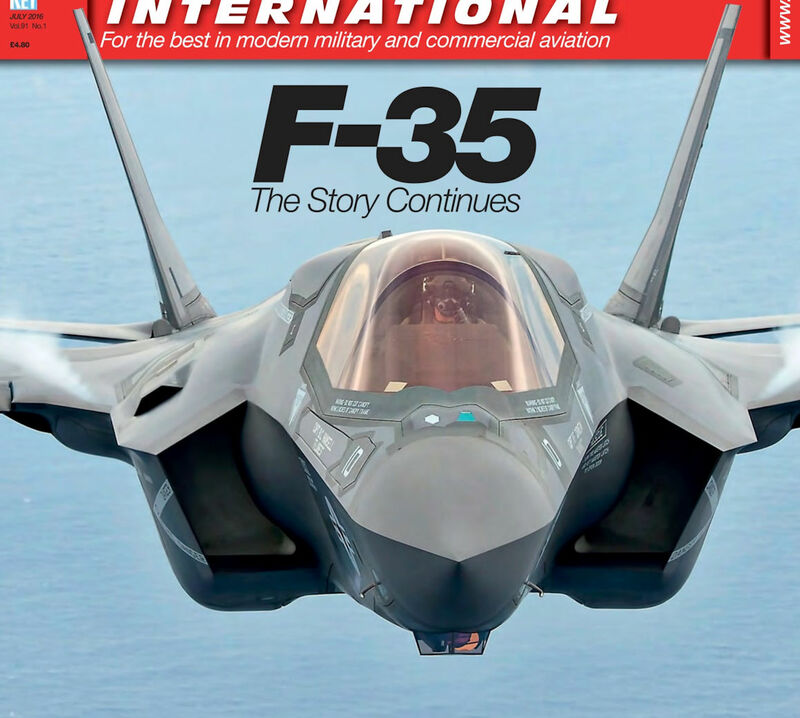 Все три основные модификации F-35 в значительной степени унифицированы. Первый самолет заказчик получил в 2011 году. Как ожидается, самолет станет массовым и будет принят на вооружение не только в США, но во многих других странах. 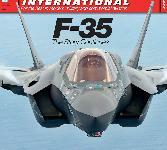 Подвариант F-35I разрабатывается для Израиля и будет оснащаться израильскими БРЭО и вооружением. 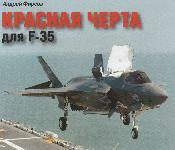 Другой подвариант CF-35 проектируется для Канады и будет оборудован системой дозаправки в воздухе, как на F-35B/C, и тормозным парашютом. Вариант короткого взлета и вертикальной посадки F-35B оснащен подъемным вентилятором и отклоняемым соплом основного двигателя. 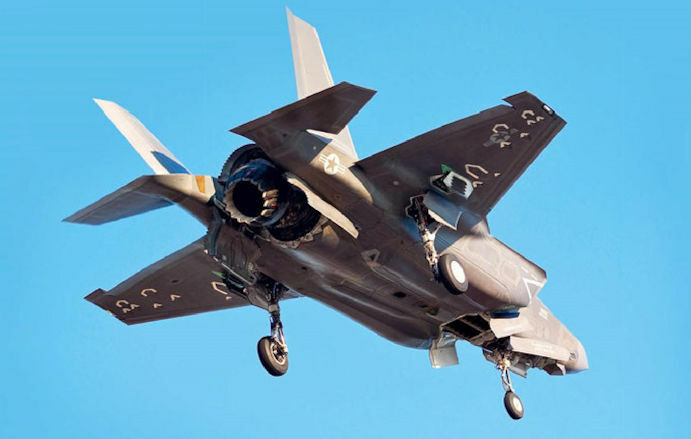 Ожидается, что заказчиками F-35B станут КМП США и ВМС Италии. 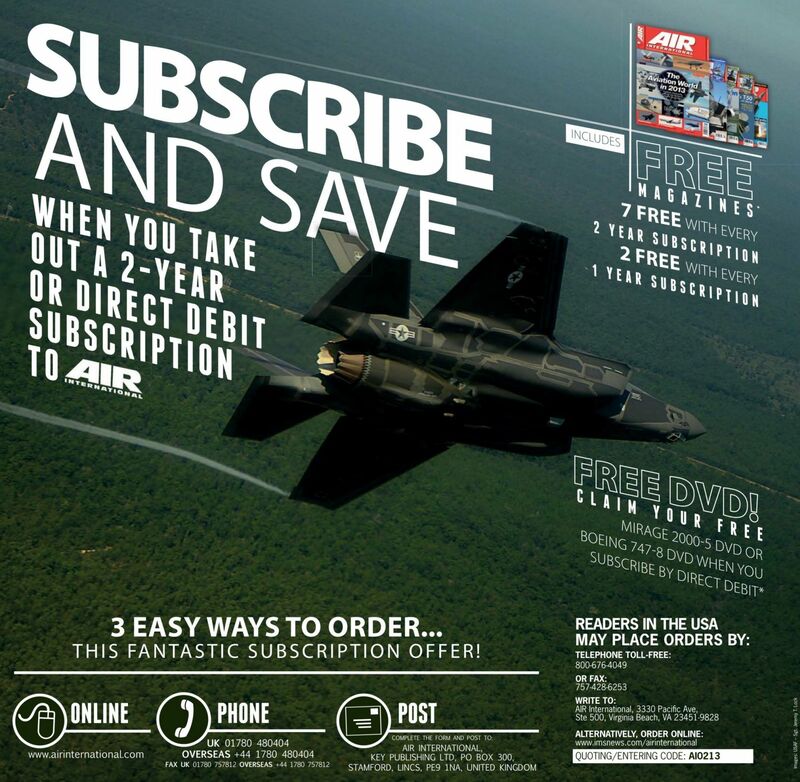 F-35C с крылом большой площади предназначен для эксплуатации с авианосцев ВМС США и Великобритании. Возможно, что самолет закажут ВВС Великобритании. 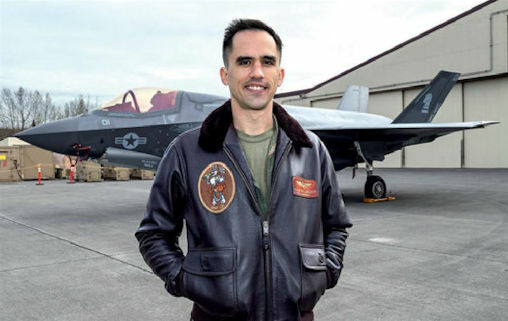 Окончательная судьба всей программы F-35 не прояснилась и в настоящее время из-за скачкообразного роста стоимости и постоянно возникающих проблем технического плана, особенно с вариантом F-35B. 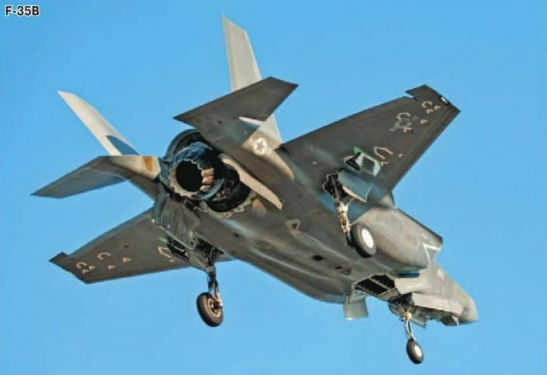 Авиация и Космонавтика 2010-02 / В.Ильин - F-35: суперистребитель XXI века или дорогостоящая ошибка? 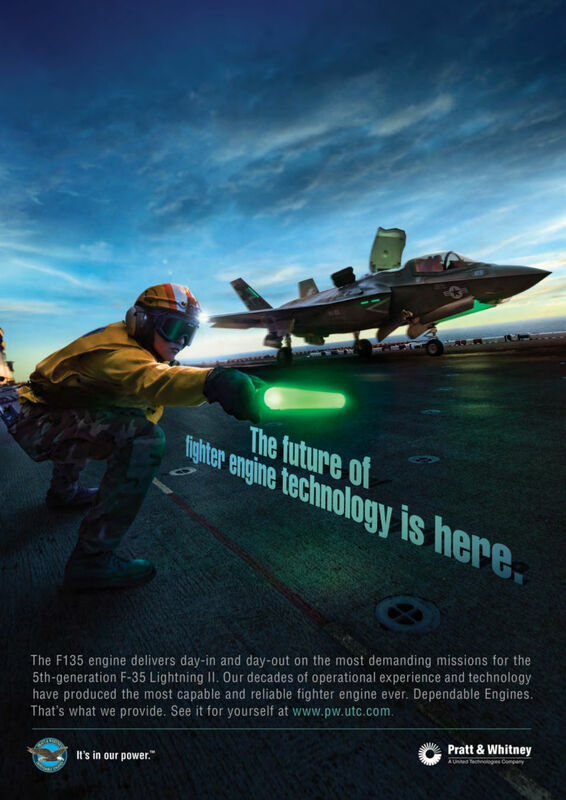 Истребитель Lockheed Martin F-35 будет строиться в трех вариантах: F-35A - для ВВС, F-35B с укороченным взлетом и вертикальной посадкой - для Корпуса морской пехоты и F-35C - для действий с авианосцев. 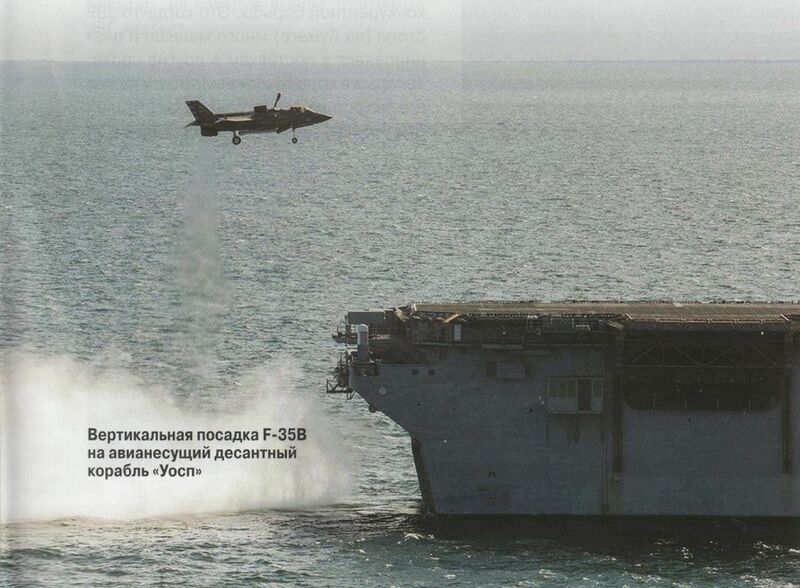 На фотографии: первый полет F-35B. На вооружении авиации КМП США состоят СВВП Harrier. Британские ВМС приспособили Harrier для базирования на кораблях сравнительно небольшого водоизмещения. 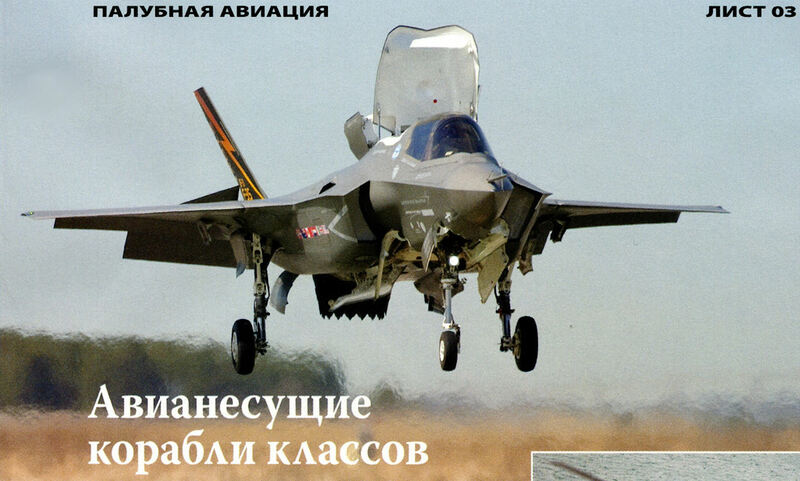 Этот опыт нашел развитие в создании КВП F-35B - специализированной модификации многоцелевого F-35. 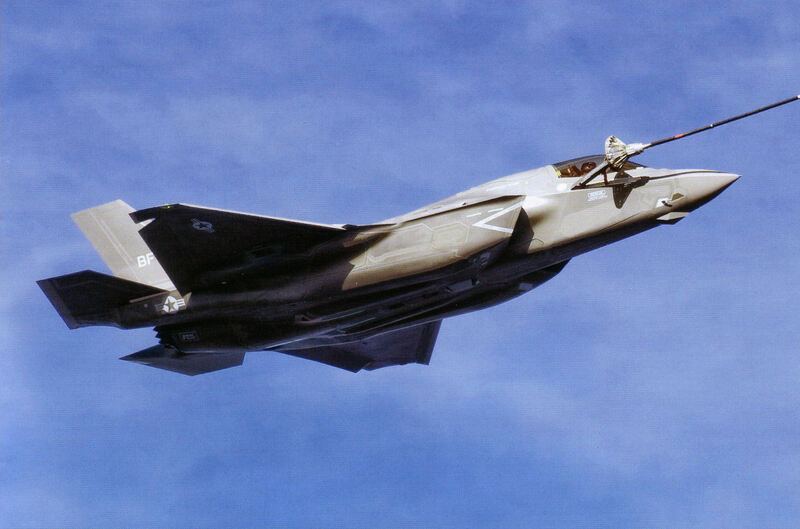 При работе подъемного вентилятора у F-35B для подвода воздуха к вентилятору открывается большой щиток. 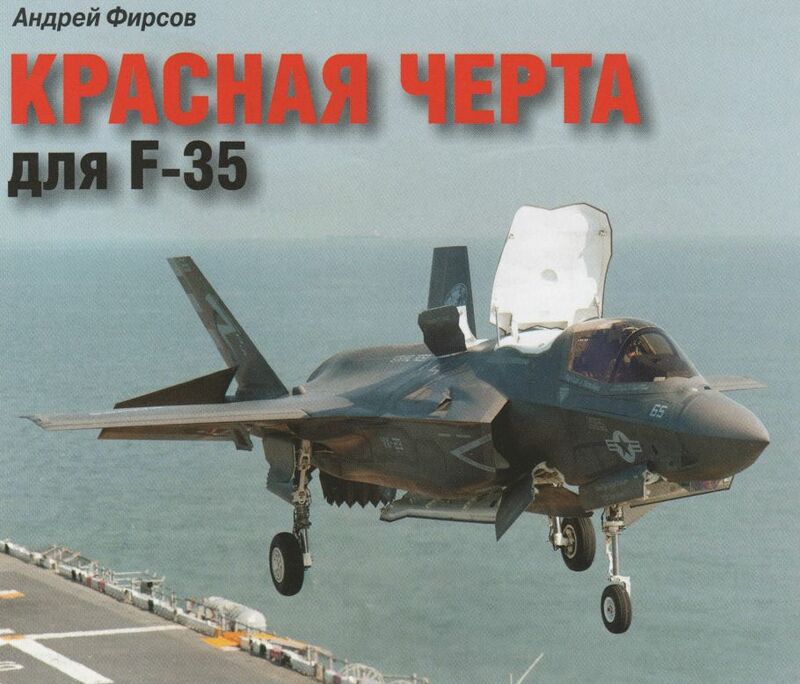 F-35B является самым сложным из всех трех вариантов самолета. 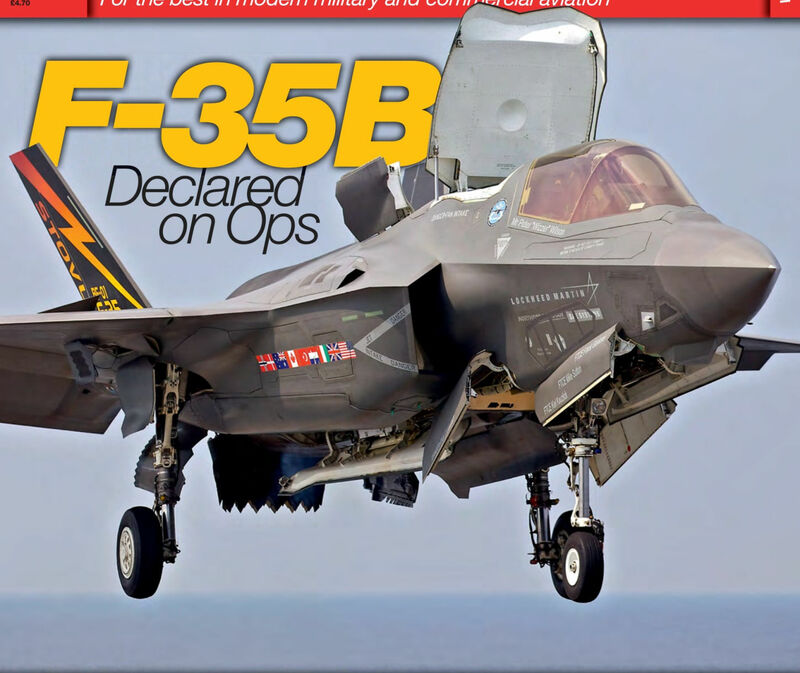 F-35B test aircraft BF-01 comes in for a vertical landing aboard the USS Wasp (LHD-1) on August 19, 2013 during DT-II. 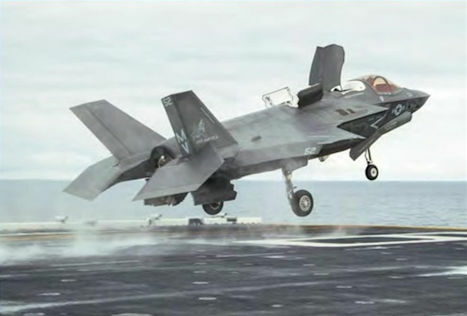 The second phase of ship suitability sea trials expanded the F-35B's operational envelope around the ship in short take-off/vertical landing mode. 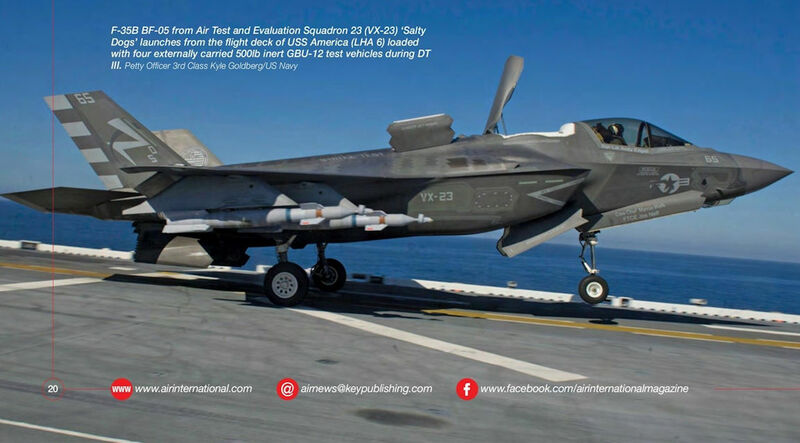 F-35B test aircraft BF-01 is cleared for short take-off from the deck of the USS Wasp (LHD-1) on August 20, 2013. 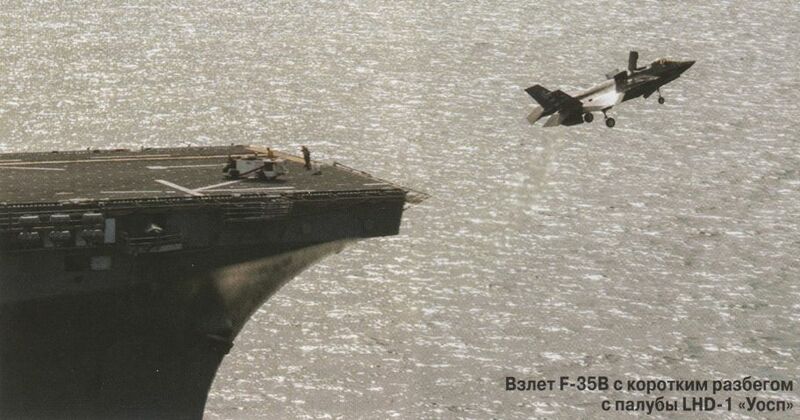 BF-01 and its sister BF-05 deployed aboard the Wasp for the second phase of ship suitability sea trials, also known as developmental test phase two (DT-II). 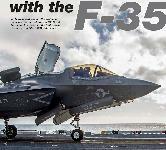 F-35B test aircraft BF-01 takes off from the deck of the USS Wasp (LHD-1) on August 15, 2013. F-35B BF-02 loaded with two ASRAAM Dummy Air Training Missiles over the Eastern Shore of Maryland on November 10, 2014 during a flutter test mission from NAS Patuxent River flown by Squadron Leader Andy Edgell. 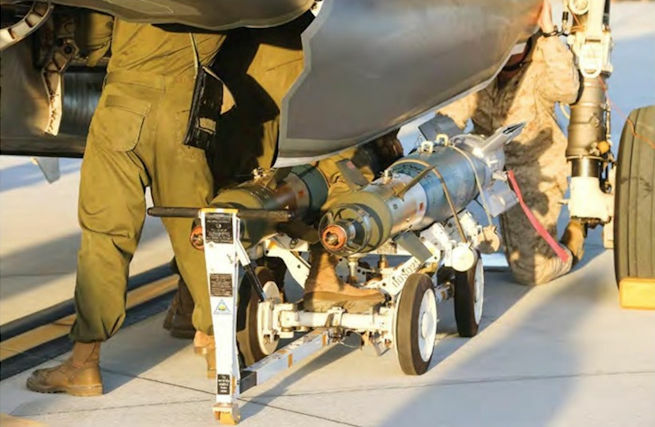 F-35B BF-02 during the first flutter test mission of the Paveway IV precision-guided bomb, in this case Ballistic Standard Test Vehicles, flown by Lockheed Martin’s test pilot Billie Flynn on November 13, 2014. Авиация и Космонавтика 2015-11 / А.Фирсов - "Лайтнинг" II - Боеготовность достигнута? 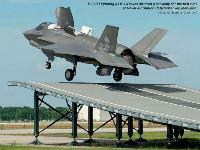 F-35B Lightning II BF-04 takes off from a ski-jump for the first time at Naval Air Station Patuxent River, Maryland. 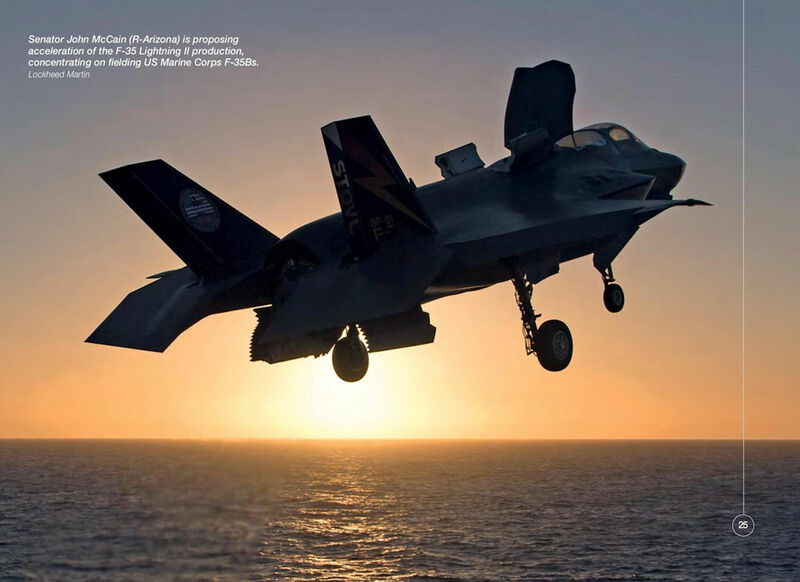 An F-35B Lightning II assigned to VMFA-121 conducts a vertical landing at Red Beach on December 10, 2015. 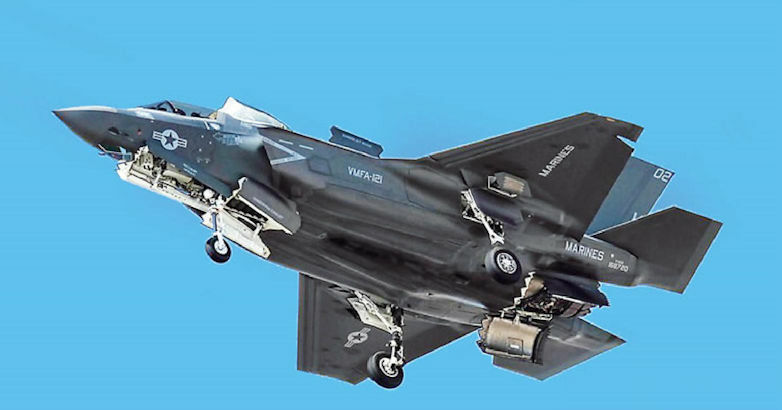 Senator John McCain (R-Arizona) is proposing acceleration of the F-35 Lightning II production, concentrating on fielding US Marine Corps F-35Bs. 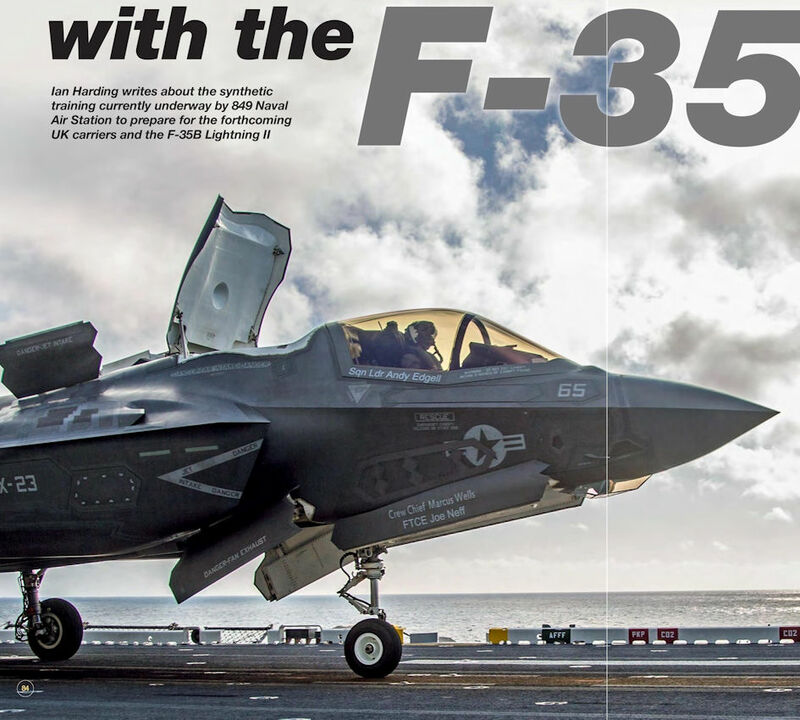 US Marine Corps F-35B Lightning II BuNo 169028/ VM28 assigned to Marine Fighter Attack Training Squadron 501 (VMFAT-501) ‘Warlords’ lands on the flight deck aboard the amphibious assault ship USS Wasp (LHD 1) during the ship’s certification exercise in the Atlantic Ocean during August 2017. A VMFA-121 F-35B Lightning II conducts a vertical landing at Marine Corps Air Station Iwakuni on February 3, 2017. 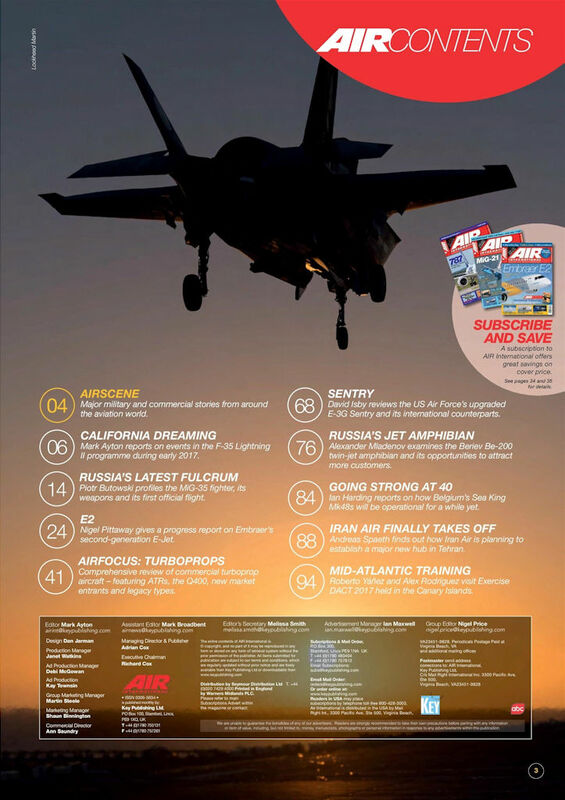 Вертикальная посадка F-35B на авианесущий десантный корабль "Уосп"
The seven-week at sea period aboard the USS Wasp involved six F-35Bs: four from VMFA-121 and two from Marine Fighter Attack Training Squadron 501 (VMFAT-501) ‘Warlords’ based at Marine Corps Air Station Beaufort, South Carolina. F-35B BuNo 169024/'VM11 ’ assigned to VMFAT-501 is shown on take off from the USS Wasp. 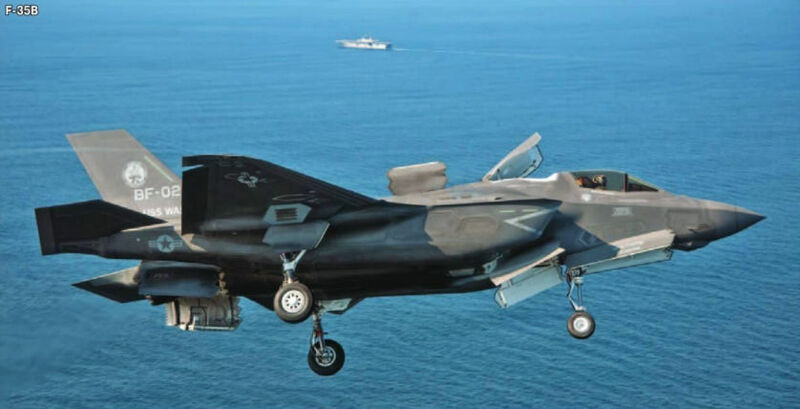 VX-23 F-35B test aircraft BF-01 loaded with a symmetric external load comprising two AIM-9X Sidewinder air-to-air missiles and four GBU-12 laser-guided bombs during DT III on board the USS America. 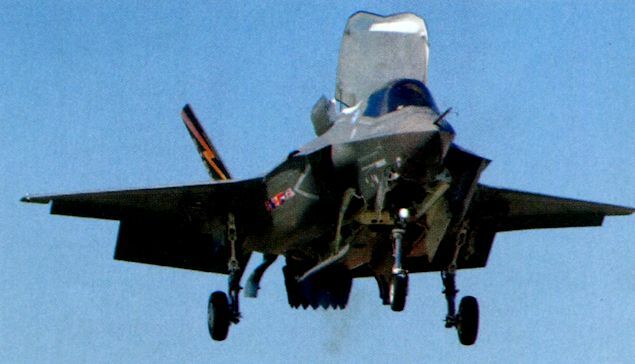 One of the test team’s objectives for DT III was to conduct vertical landings and short take-offs with symmetric and asymmetric external loads carriage. 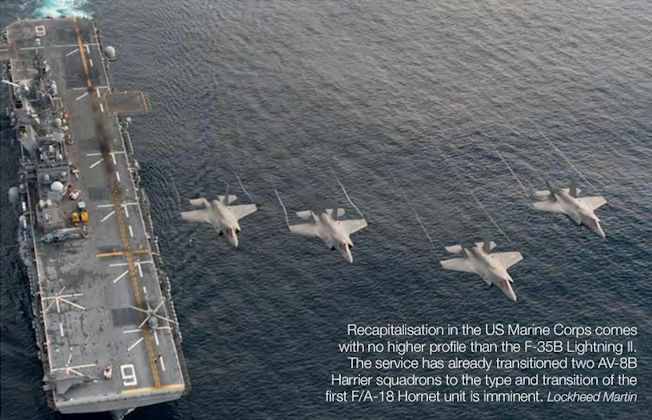 USS America (LHA 6) underway off the coast of California on the first day of the Lightning Carrier Proof of Concept Demonstration with 12 F-35Bs on deck. 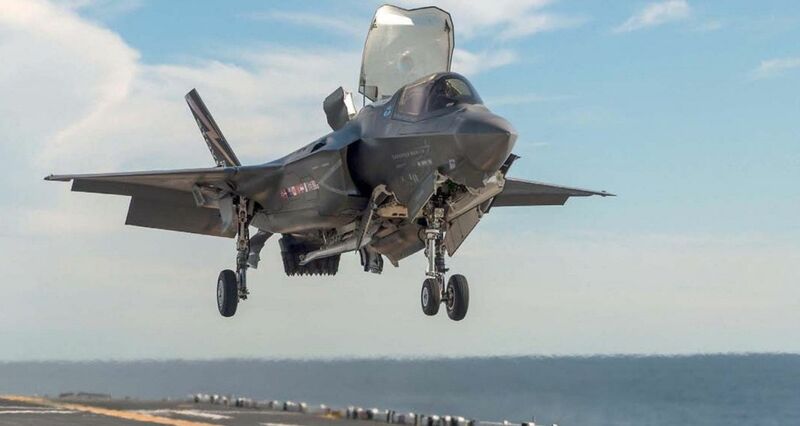 F-35B BF-05 from Air Test and Evaluation Squadron 23 (VX-23) ‘Salty Dogs' launches from the flight deck of USS America (LHA 6) loaded with four externally carried 500 lb inert GBU-12 test vehicles during DT III. 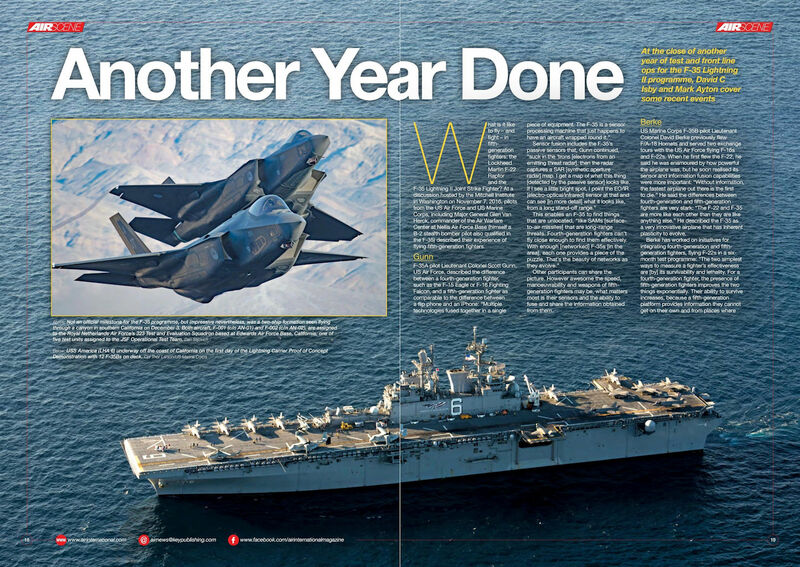 The F-35 detachment of Marine Operational Test and Evaluation Squadron 1 (VMX-1) based at Edwards Air Force Base, California embarked three F-35Bs on board the USS America for the type's third set of F-35B ship trials, referred to as Developmental Test III (DT III), from October 28 through November 17, 2016. 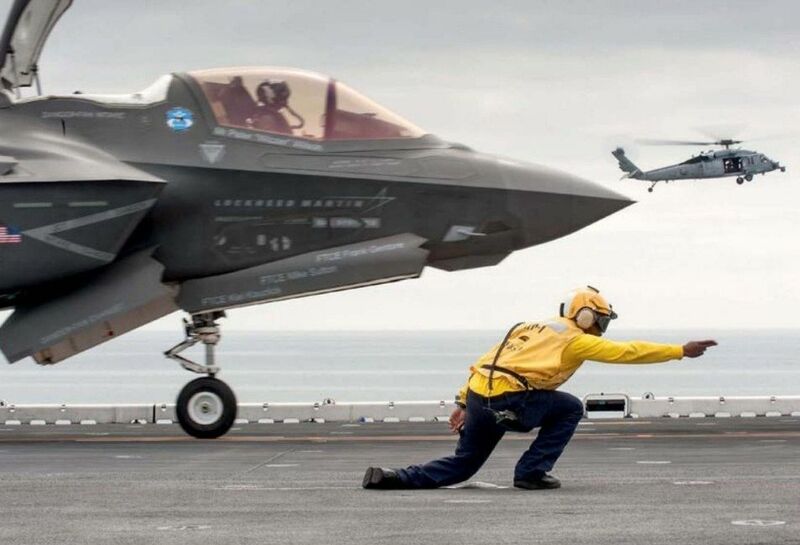 Взлет F-35B с коротким разбегом с палубы LHD-1 "Уосп"
An F-35B Lightning II performs a conventional take-off at the Strategic Expeditionary Landing Field at Twentynine Palms SELF on December 11,2015. On June 30, 2016, UK F-35B ZM137 and US Marine Corps aircraft BuNo 168727/VM19 flew in formation with RAF Tornado GR4 ZG771 over RAF Marham, Norfolk. 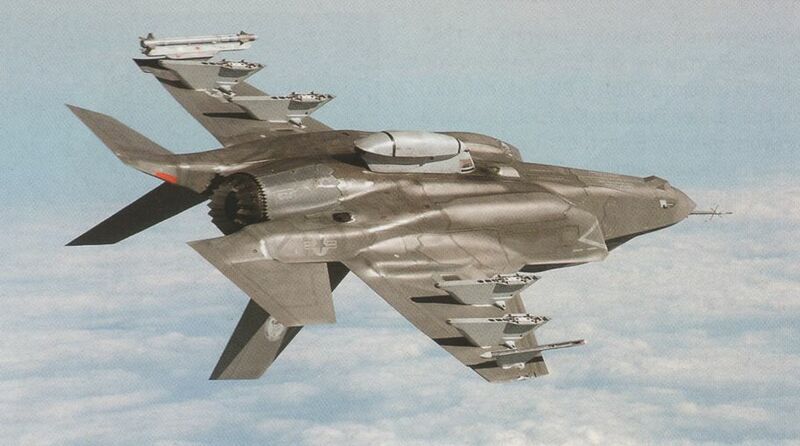 This was the first flight of an F-35B at Marham, which also included one low and one STOVL approach and fly away. 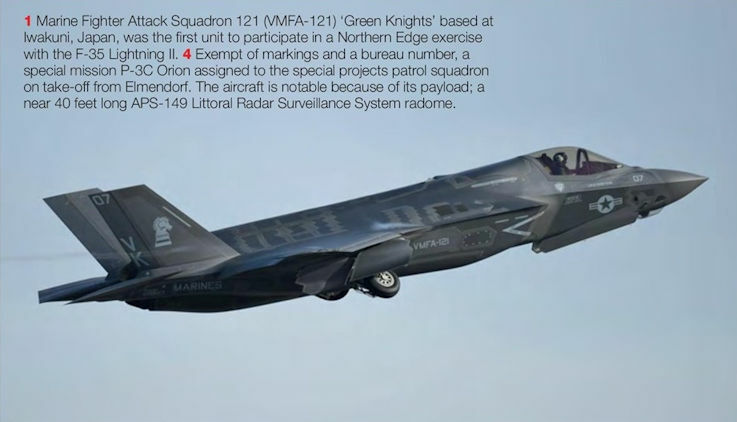 Marine Fighter Attack Squadron 121 (VMFA-121) 'Green Knights’ based at Iwakuni, Japan, was the first unit to participate in a Northern Edge exercise with the F-35 Lightning II. 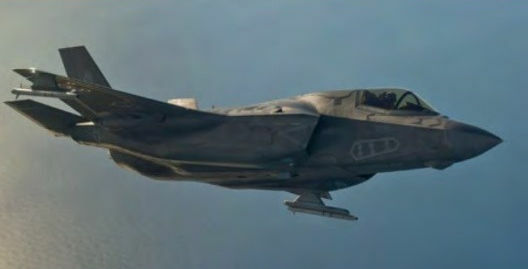 F-35B BuNo 168313/17 (c/n BK-17), one of two assigned to the 461st FLTS, fires an AIM-120 AMRAAM instrumented test vehicle above the Point Mugu Sea Range, California. 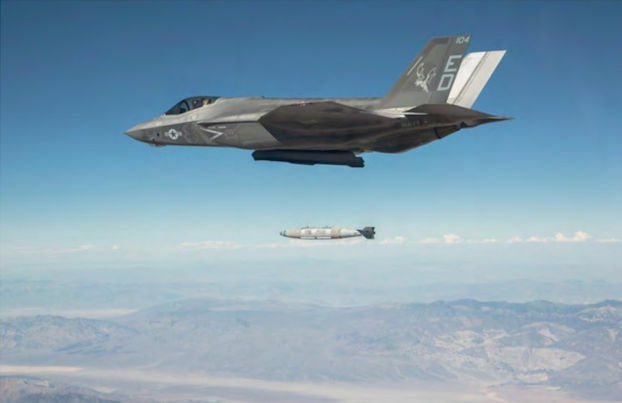 Production standard US Marine Corps F-35B BuNo 168313/‘VK13', currently as­signed to the 461st Flight Test Squadron at Edwards AFB, releases a GBU-12 Paveway II laser-guided bomb from the internal weapons bay against a fixed target located in a test range on October 29, 2013. 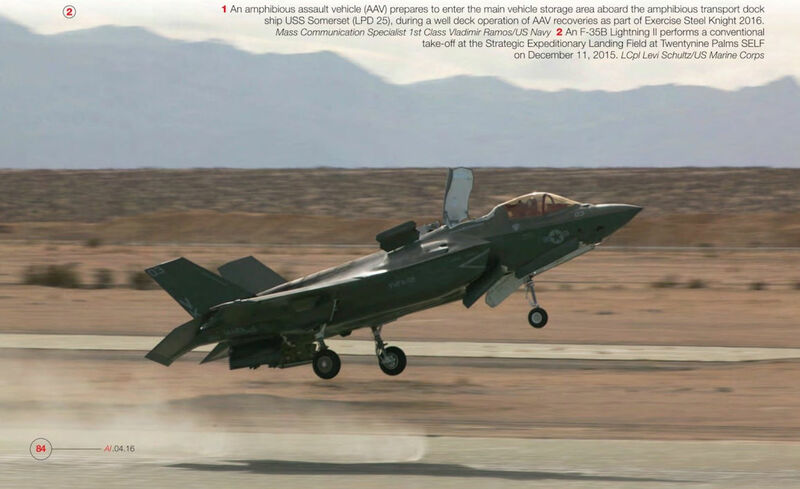 US Marine Corps Lockheed Martin F-35B Lightning II BuNo.168717/‘MV-05’ arriving at Edwards Air Force Base, California, on October 9, 2014. 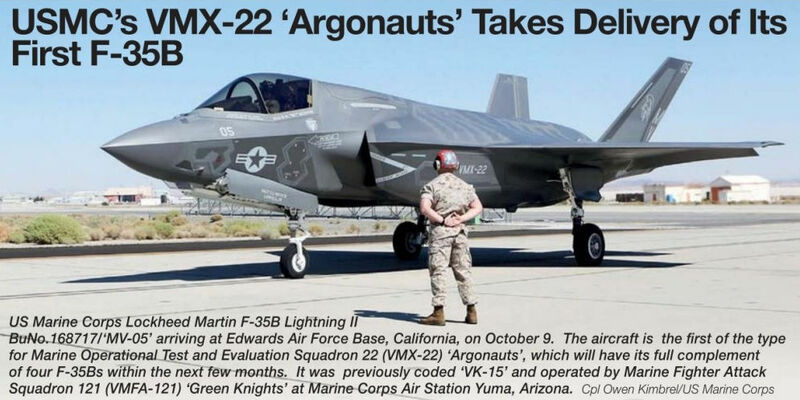 The aircraft is the first of the type for Marine Operational Test and Evaluation Squadron 22 (VMX-22) ‘Argonauts’, which will have its full complement of four F-35Bs within the next few months. 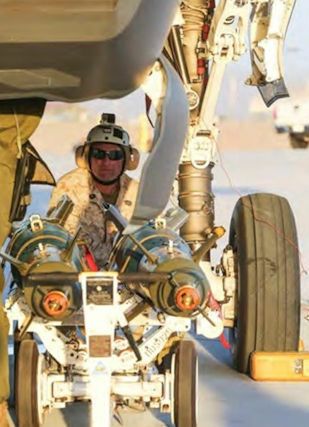 It was previously coded ‘VK-151 and operated by Marine Fighter Attack Squadron 121 (VMFA-121) ‘Green Knights' at Marine Corps Air Station Yuma, Arizona. Marines hook up a hose for a power cart before a weapons functional test during Exercise Steel Knight at Marine Corps Air Ground Combat Center Twentynine Palms, California. 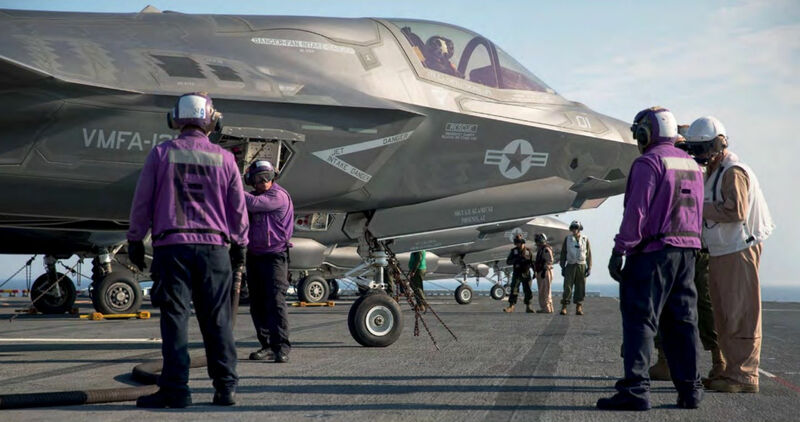 Aviation fuel handlers refuel an F-35B on the flight deck of USS Wasp on May 18 during the seven-week at sea period known as OTI (Operational Test Phase One). 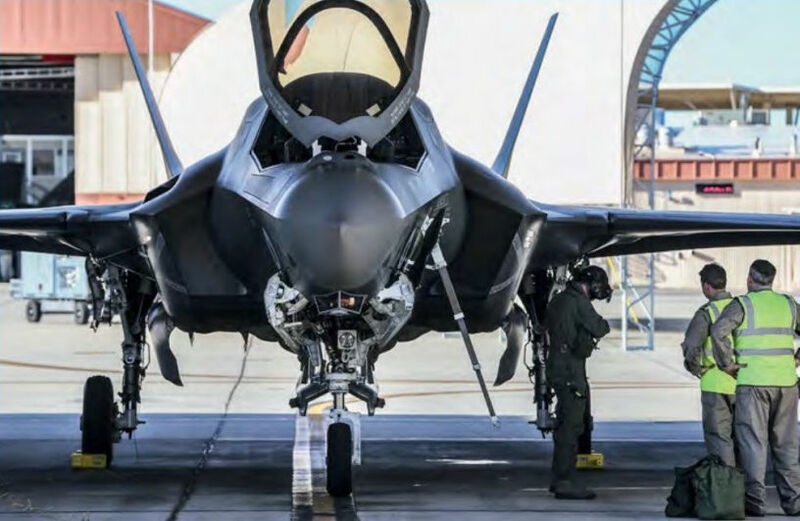 An avionics technician assigned to VMFA-121 performs a weapons functional test on an F-35B Lightning II at Twentynine Palms. 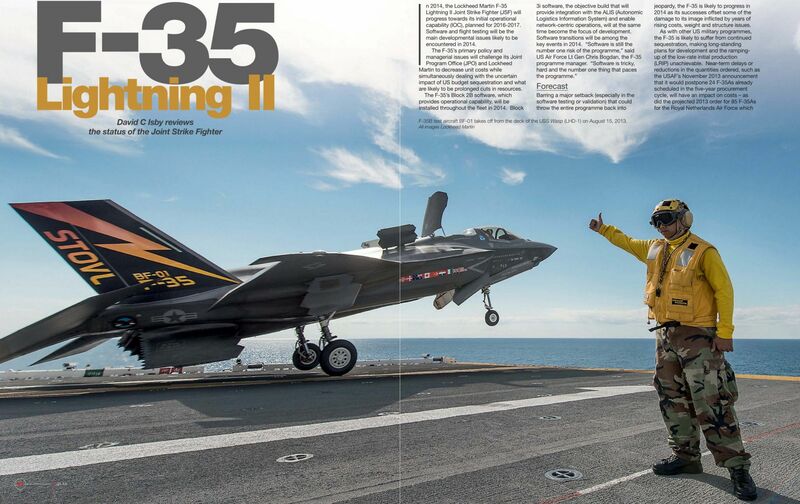 An aviation ordnance chief supervises the first ever hot load on the F-35B Lightning II. 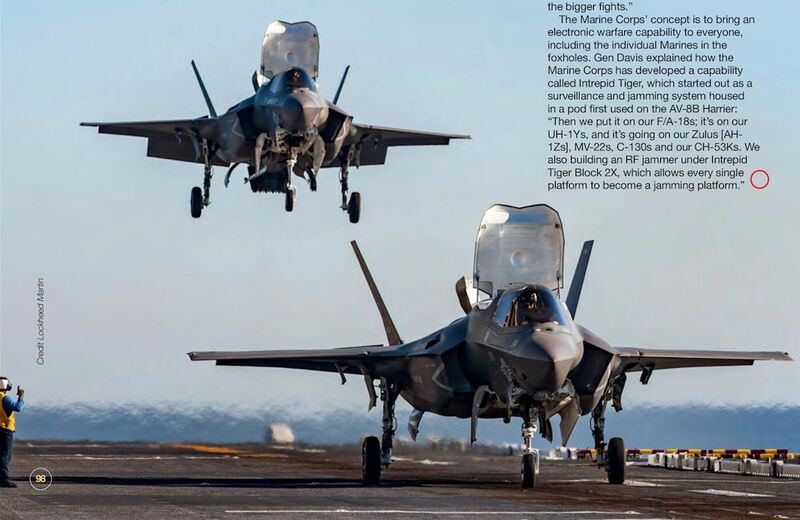 Marines conduct the first ever hot load on the F-35B Lightning II during WTI 1-17 at Marine Corps Air Station Yuma, on September 22, 2016. 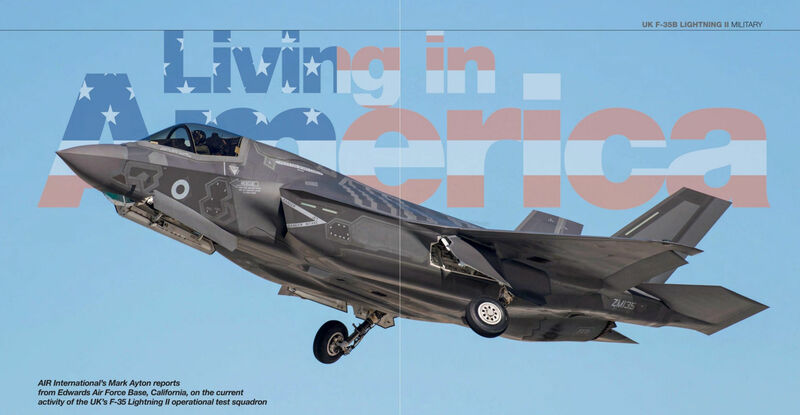 Lockheed Martin F-35B Lightning II ZM137 made its second flight on April 5, 2013. 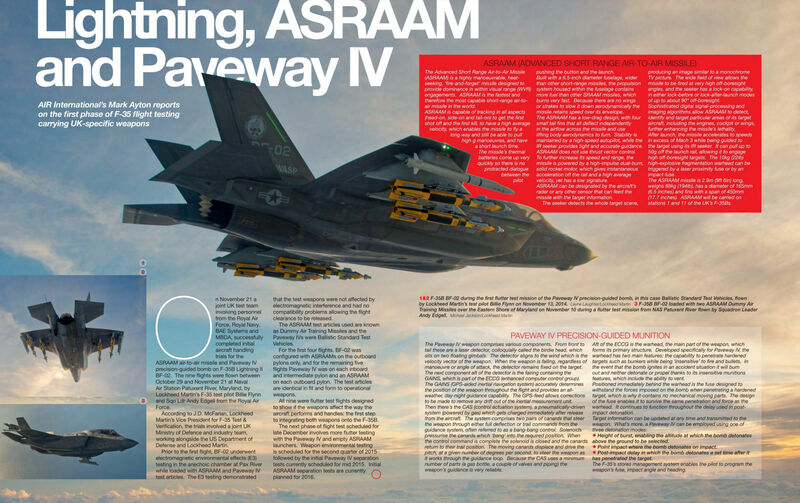 The UK is gradually building up its fleet of F-35Bs. 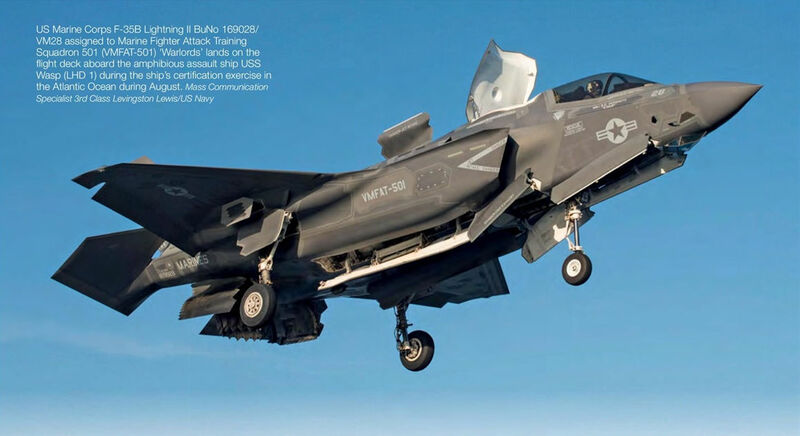 In early December 2016 F-35B ZM140 (c/n BK-06) was delivered to Marine Corps Air Station Beaufort to join the ranks of Marine Fighter Attack Training Squadron 501 (VMFAT-501) ‘Warlords'. 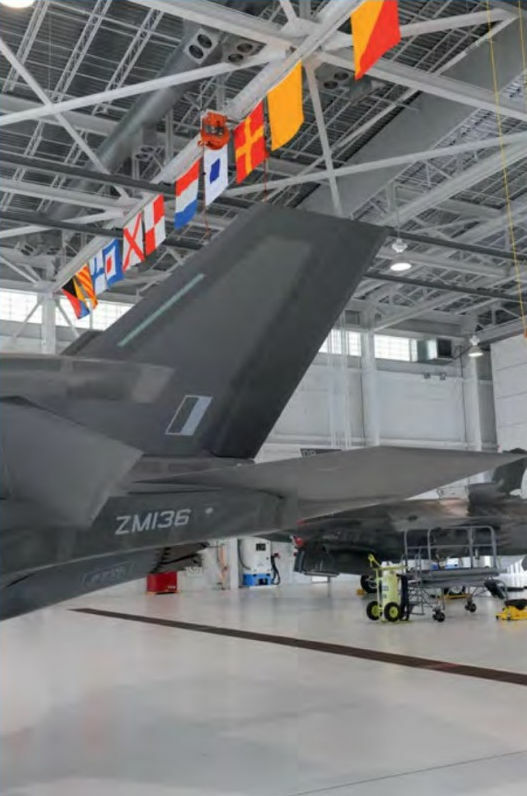 UK F-35Bs ZM141 (c/n BK-07) and ZM142 (c/n BK-08) shown here are already flying with Lockheed Martin at Fort Worth. 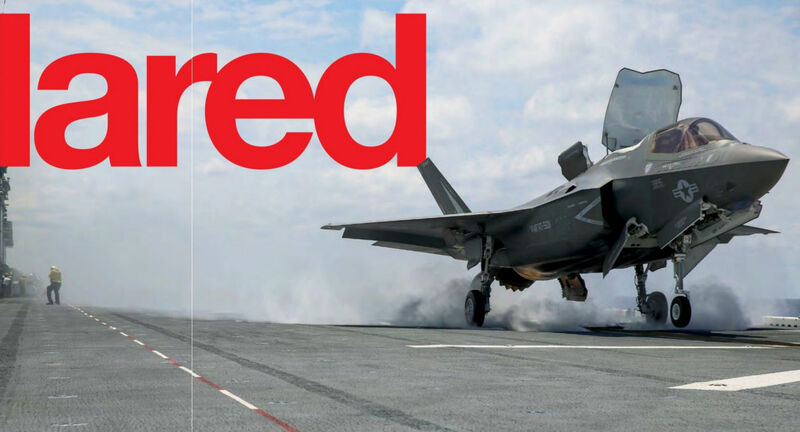 A highlight of this year’s Royal International Air Tattoo at RAF Fairford was the daily formation flypast by the Royal Air Force Red Arrows with an F-35B and a Typhoon or two (depending on serviceability). That's showbiz! 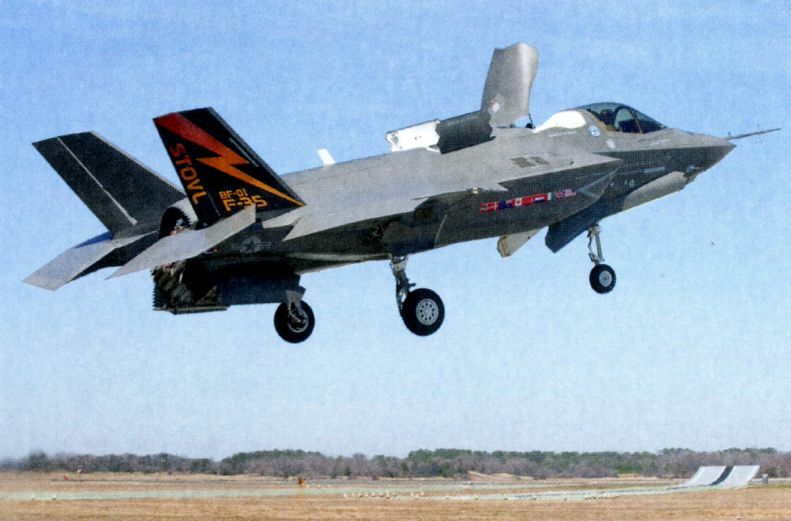 F-35B Lightning II ZM135 (BK-01) seen on take-off from Edwards on February 5, 2015 for a test mission flown under full UK legislation. 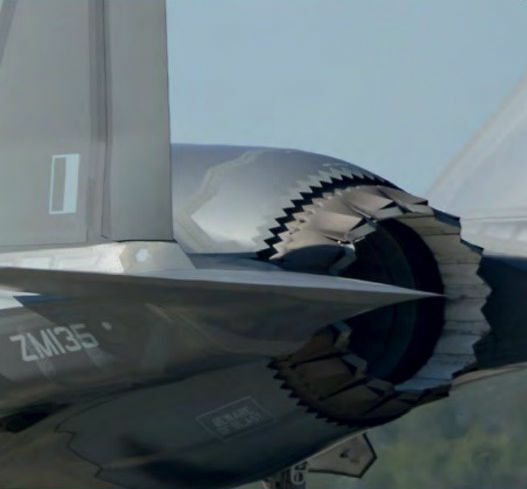 The fourth F-35B Lightning II for the UK ZM138 (c/n BK-04) made its maiden flight on December 2, 2015 followed by its second flight two days later. 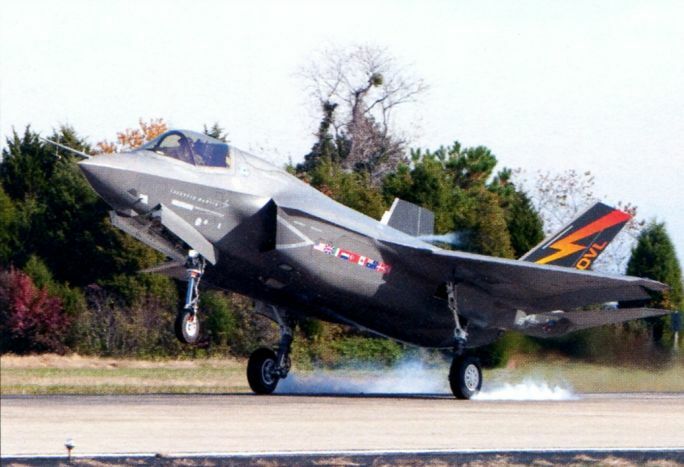 During its second flight the test pilot converted to mode 4 flight; the first time a UK F-35B has flown in mode 4 at Naval Air Station Joint Reserve Base Fort Worth, Texas. 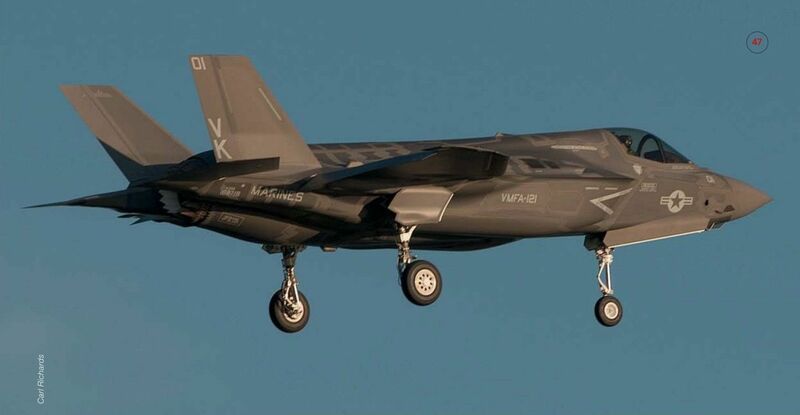 Despite its allocation to No.17(R) Squadron, F-35B ZM135 (BK-01) will remain devoid of any squadron markings in accordance with the UK’s operational test criteria. 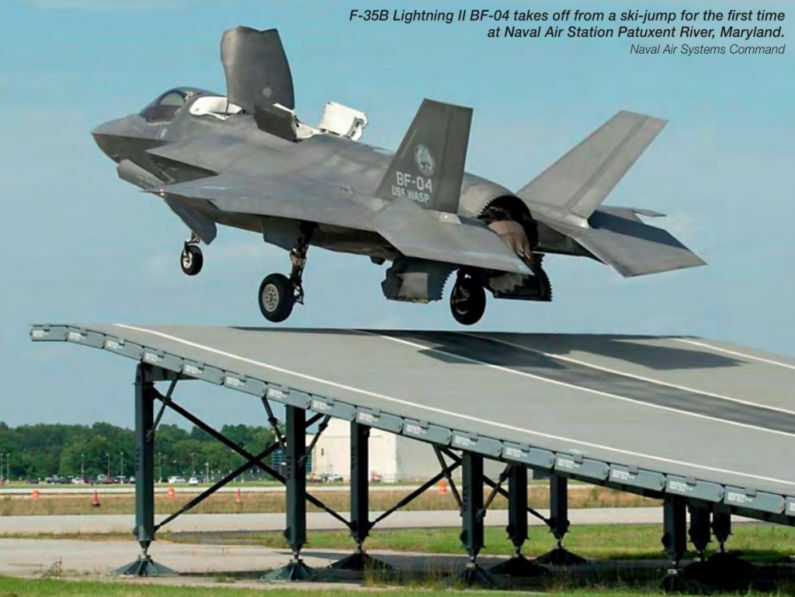 At 2007hrs local time on June 28, 2016, aviation history was made at RAF Fairford when F-35B Lightning II ZM137 (c/n BK-03) landed at the Gloucestershire base; the first F-35 to land on UK soil. 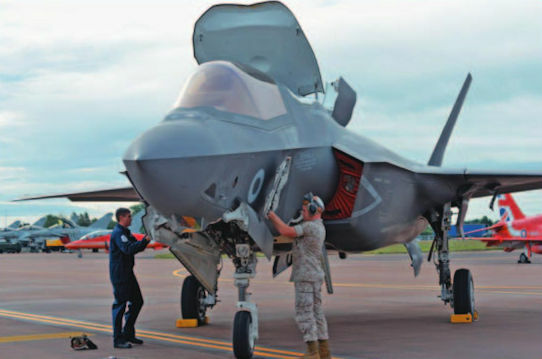 Accompanied by two US Marine Corps F-35Bs assigned to Marine Fighter Attack Training Squadron 501 (VMFAT-501) ‘Warlords’ based at Marine Corps Air Station Beaufort in South Carolina, the three jets arrived in the UK to participate in the Royal International Air Tattoo at Fairford and the Farnborough International Airshow. 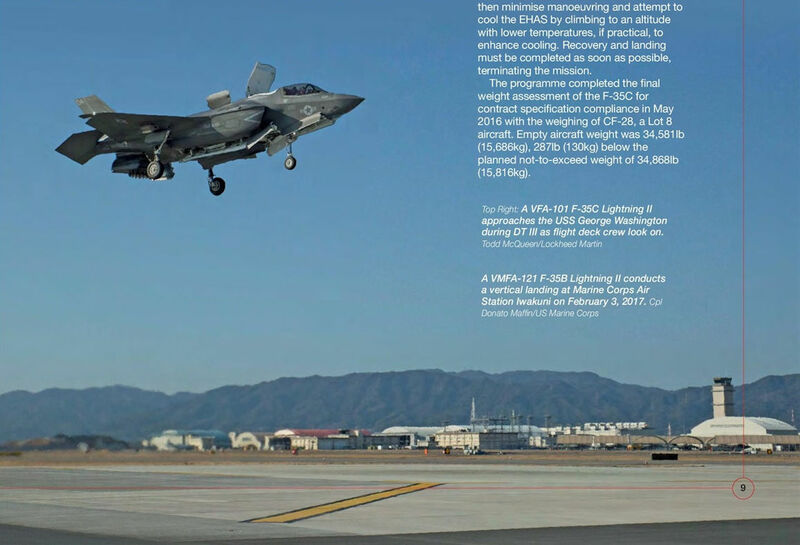 UK F-35B ZM135 (BK-01) taxies in from runway 22 at Edwards on its arrival at its new home: Edwards Air Force Base, California. 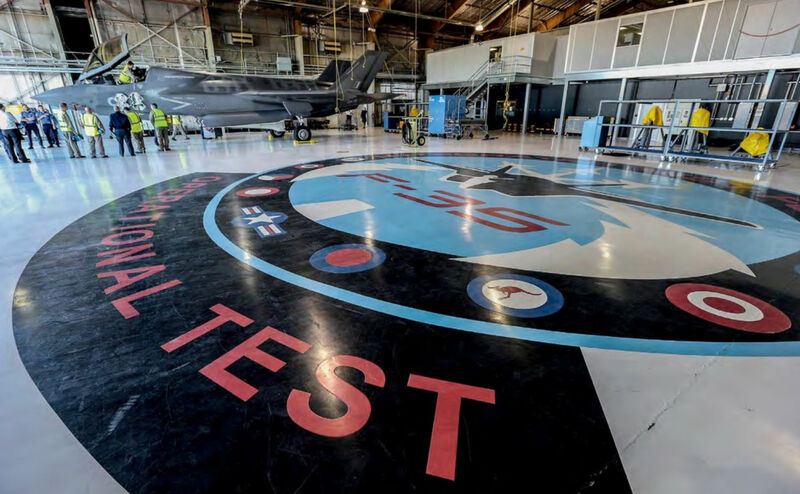 Artwork decorating the floor of the main F-35 hangar used by the four test squadrons assigned to the JOTT at Edwards. 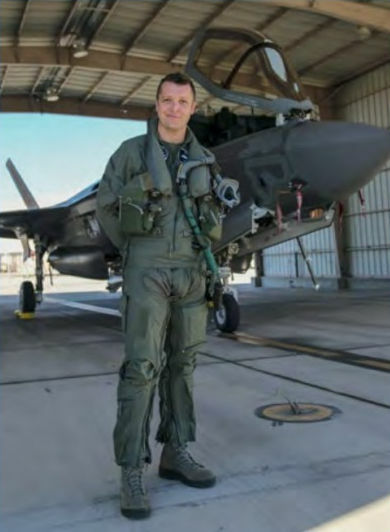 Wg Cdr Jim Beck loosens up his flight gear after the ferry flight from the East Coast to Edwards Air Force Base on January 13, 2015. 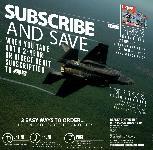 OC No.17(R) Squadron, Wg Cdr Jim Beck is a former Tornado GR4 pilot who served with No.XI(B) and No.XIII Squadrons. 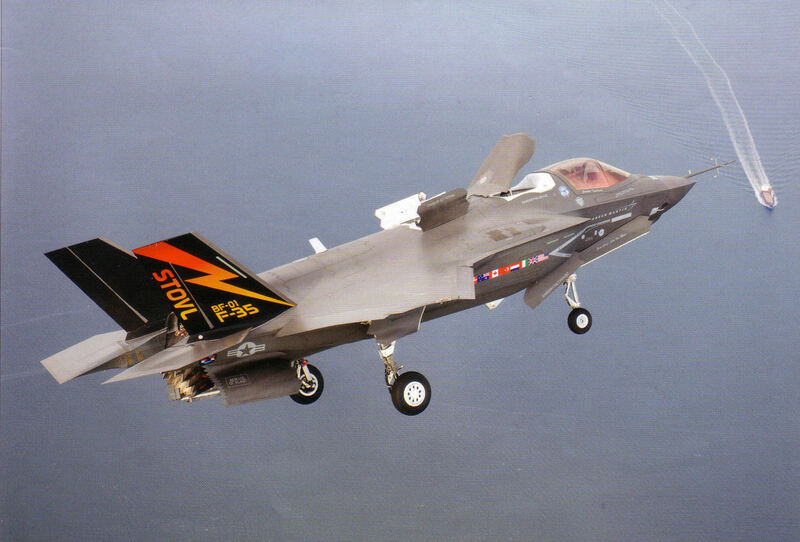 F-35B Lightning II ZM136 (BK-02) was due to be delivered to Edwards Air Force Base in January 2015. 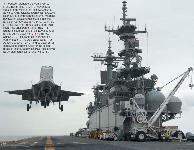 The aircraft is now expect­ed at the Californian super base sometime in March. 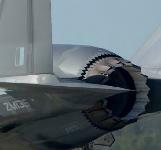 The serrated edges of the F-35B's nozzle are clearly shown in this photo. 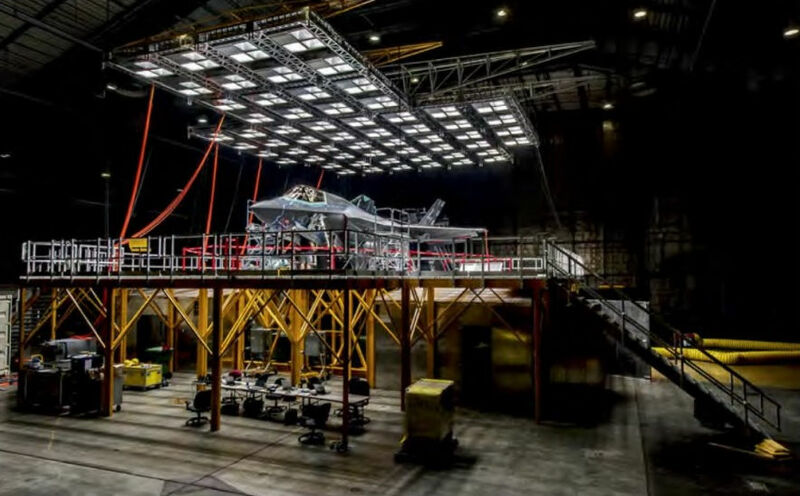 F-35B Lightning II BF-05 under the solar array during a diurnal cycle solar load test on October 6, 2014. 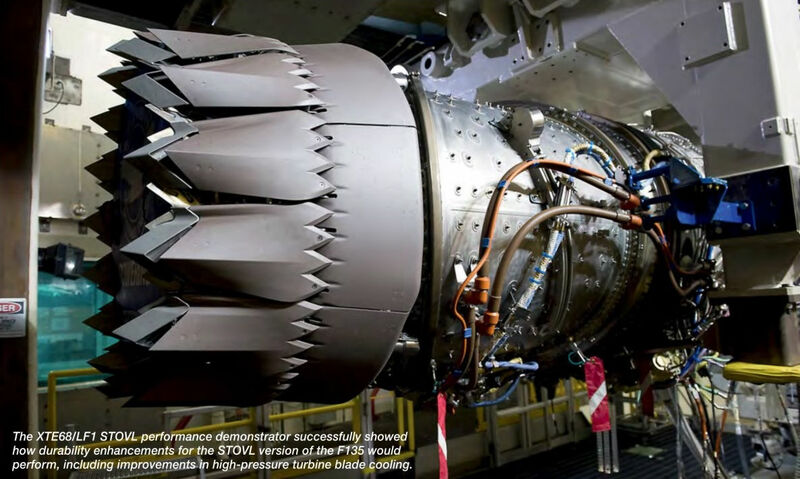 The icing tunnel, or ice cloud test fixture, in front of F-35B BF-05 during calibration runs on January 13, 2015. Ice accretion after three hours of a calibration run on January 25, 2015. 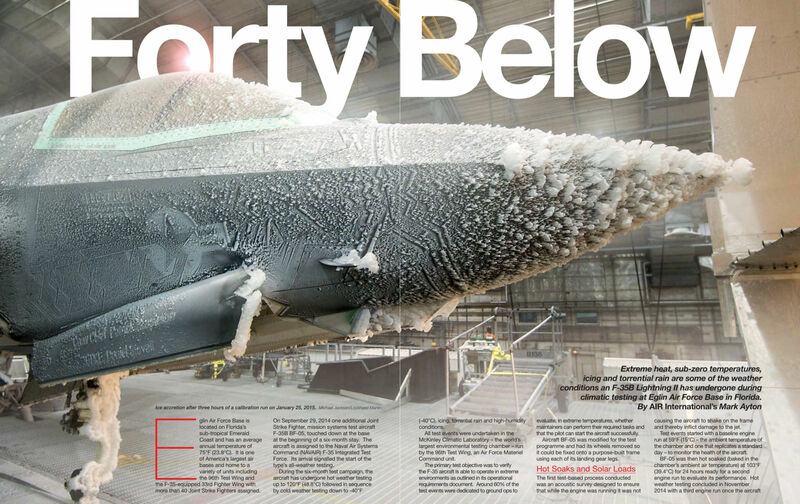 Left: The forward fuselage of BF-05 enveloped in an ice cloud during a calibration run on January 25, 2015. Middle: Water enters the duct at the forward point of the tunnel’s contraction section and is blown through nozzles at the jet where it accretes as ice.